I've been cooking a fair bit of late.. just before bed time. I cook and have the food cook overnight in my Thermos Thermal Cooker and re-heat it in the morning to take them to work. This way, the hubby can also have his meal just before his work. This recipe was inspired by Chris of Budget Pantry's recipe. I tweaked it to suit us. The beauty of this recipe is the melt-in-the-mouth fatty pork belly. Coupled with rice, it's a delight to have! I'd rate this a difficulty level 2 out of 5. It can be an overnight recipe or one that's ready in 3 hours. 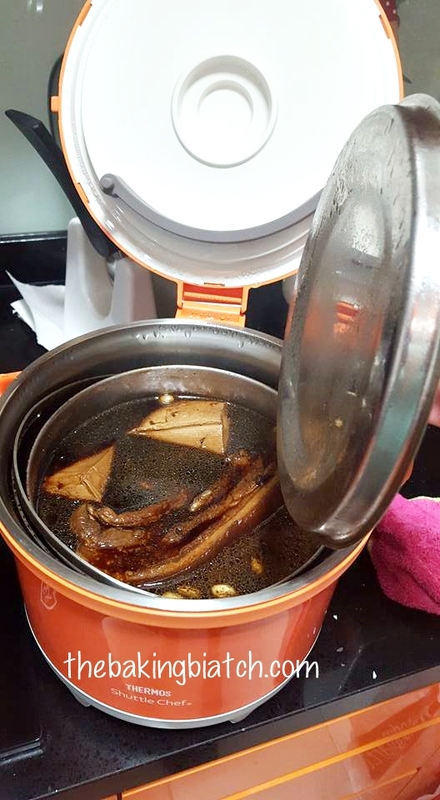 1) Boil the pork belly in a pot of water for 5 - 10 mins to remove scum. Set aside. 2) In a bowl, mix liquids together. 3) Bring liquid to a boil with the pork belly. 4) Add spices and garlic. 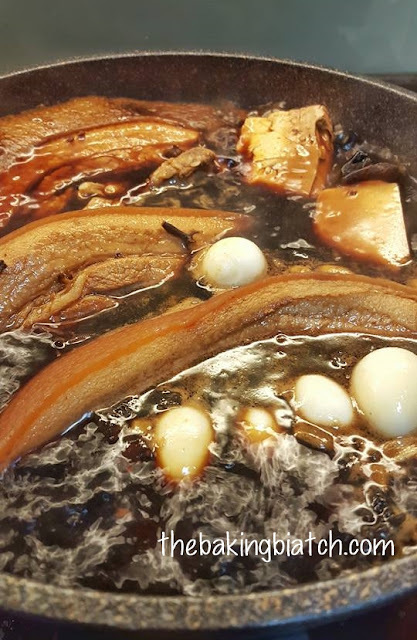 5) Add tau kwa and boiled quail's eggs. It's soft yet firm enough to withstand the braising. LOVE LOVE IT! 6) Bring the mixture to a boil. A general rule of thumb for thermal cookers, it works best when filled/almost full. That way, the liquids can continue cooking whatever's inside the thermal cooker. If there is insufficient water, add a little more. 7) Allow mixture to boil for 15 minutes on medium-high heat. 8) Place lid semi-closed on the pot and allow mixture to boil for 1-2 more mins to warm up the lid too. 9) Remove from heat and allow thermal cooker to continue the cooking overnight. If you do not have a thermal cooker, you can cook the dish over the stove for 2 - 2.5 h on medium-low heat. 10) Allow meat to cook overnight. I usually cook it by 10pm at night and it's good to go at 6am the following morning. 12) Serve with plain rice! I usually transfer a portion to my Thermos food jars to take to work.. The food is still hot when I have it at 10am. The same theory works.. fill the jars with as much food/liquid as you can.